Where population coverage is limited, the exclusive use of Cancer Registries might limit ascertainment of incident cancer cases. We explored the potentials of Nationwide hospital discharge records (NHDRs) to capture incident breast cancer cases in Italy. We analyzed NHDRs for mastectomies and quadrantectomies performed between 2001 and 2008. The average annual percentage change (AAPC) and related 95% Confidence Interval (CI) in the actual number of mastectomies and quadrantectomies performed during the study period were computed for the full sample and for subgroups defined by age, surgical procedure, macro-area and singular Region. Re-admissions of the same patients were separately presented. The overall number of mastectomies decreased, with an AAPC of −2.1% (−2.3 -1.8). This result was largely driven by the values observed for women in the 45 to 64 and 65 to 74 age subgroups (−3.0%, -3.4 -3.6 and −3.3%, -3.8 -2.8, respectively). We observed no significant reduction in mastectomies for women in the remaining age groups. Quadrantectomies showed an overall +4.7 AAPC (95%CI:4.5–4.9), with no substantial differences by age. Analyses by geographical area showed a remarkable decrease in mastectomies, with inter-regional discrepancies possibly depending upon variability in mammography screening coverage and adherence. Quadrantectomies significantly increased, with Southern Regions presenting the highest average rates. Data on repeat admissions within a year revealed a total number of 46,610 major breast surgeries between 2001 and 2008, with an overall +3.2% AAPC (95%CI:2.8-3.6). In Italy, NHDRs might represent a valuable supplemental data source to integrate Cancer Registries in cancer surveillance. Cancer incidence data are a cornerstone of epidemiology research, health monitoring and resource allocation for interventions aimed at cancer prevention and control. Cancer Registries (CRs) contribute to cancer surveillance at local level, throughout the process of systematic collection of data about the occurrence and characteristics of reportable neoplasms. In United States, the National cancer statistics are built on data from a network of CRs called the Surveillance, Epidemiology and End Results Program (SEER). The SEER has now expanded its coverage to 26% of the total population of the United States, accounting for 65.4 million people. Registries included in the SEER share requirements in data reporting and verification procedures throughout a quality improvement process restructured in year 2000. However, the exclusive use of CRs poses limits to the nationwide ascertainment of incident cancer cases, with major concerns arising from the percentage of US population still uncovered. Various secondary databases have been proposed as potential tools to enhance the detection of incident cases and related treatments for a number of diseases, including cancer[3–6]. The accuracy of secondary data sources in capturing cases has been explored with results varying upon the source selected and gold standard used[6–9]. In the study from Penberthy et al., the Virginia Cancer Registry (CR) and a statewide hospital discharge file (HDF) were both tested for accuracy in correctly identifying a cancer and its site of origin. Data from inpatient medical records were used as the gold standard. Based on the conclusions stated, nor the CR neither the HDF was sufficient independently to allow the complete capture of incident cancer cases. However, HDF accuracy in capturing incident cancer cases was high, with the overall positive predictive value being 94% and site specific values ranging from 86% (cervix) to 98% (breast). In Italy, the government supports cancer surveillance throughout a network of population-based local CRs included in the Italian Association of Cancer Registries (AIRTUM). Currently, the AIRTUM covers 33.8% of the Italian population, namely 19 million people out of 61 million inhabitants. A notable disproportion in CRs coverage exists among Northern, Central and Southern areas of Italy (i.e., 50.2%, 25.5% and 17.9%, respectively). We have previously underlined the need to integrate data from the Italian CRs with additional sources and identified the National Hospital Discharge Records (NHDRs) as a potential tool. In this study we aimed to evaluate the burden of breast cancer in Italian women by analyzing data from the NHDRs through a non-model-based methodology with a specific focus on major surgical procedures. Compared to our previous work, data have been updated to reflect a larger time window (2001–2008 vs. 2000–2005) and methods refined to overcome some of the limitations from our previous study. We used the NHDR database which includes records from all the Italian public and private hospitals. Data were made available by the Italian Ministry of Health relatively to the time frame between 2001 and 2008. These data were subject to a systematic quality assessment performed at a Regional and central level. The matching with the National Institute for Statistics (ISTAT) by social security code showed a percentage of correct linkage increasing from 95.6% in 2001 (50,921 records matched out of 53,226) to 99.8% in 2008 (58,367 records matched out of 58,492)[12, 13]. The years 1999 and 2000 were excluded due to incomplete data. Breast cancer cases were identified on the basis of the International Classification of Diseases, Ninth Revision, Clinical Modification (ICD-9-CM)[14, 15]. We considered patients diagnosed with invasive breast cancer (i.e., malignant neoplasm of breast, ICD-9CM codes: 174.0-174.9 and 175.0-175.9). Data related to patients with in situ breast carcinoma (ICD-9-CM major diagnosis 233) were also included. Eligible women were patients diagnosed with incident, histologically-confirmed breast cancer who underwent major breast surgical procedures between 2001 and 2008, as identified based on the following codes from the ICD-9-CM: 85.41-48 (mastectomies), 85.22 (quadrantectomies), 85.23 (subtotal mastectomies)[14, 15]. In data analysis, mastectomies and subtotal mastectomies (ICD-9-CM codes: 85.41-48 and 85.23, respectively) were ascribed to the same category of major breast surgery (i.e., mastectomies). Excision biopsies and tumorectomies (ICD9-CM code 85.21) were not included. Thus, patients with benign lesions were not considered in our analysis. In order to minimize the overlap between prevalent and incident cases, repeated admissions in any calendar year and across different years for the entire time window considered were discounted and reported separately. We included records pertinent to ordinary hospitalization as well as day hospital regimens. Data were analyzed using STATA/SE version 11 for Windows (StataCorp LP, College Station, TX, USA) and Microsoft Office Excel 2007 (Microsoft Corp, Seattle, WA, USA). The average annual percentage change (AAPC) and related 95% Confidence Interval (CI) in the actual number of mastectomies and quadrantectomies performed during the study period were computed using a Poisson regression model. To describe time trends, we carried out joinpoint regression analysis. Analyses were performed for the full sample as well as for subgroups defined by type of surgical procedure (mastectomies and quadrantectomies), age (25–39, 40–44, 45–64, 65–74 and ≥75 years old), and geographical area [i.e., Region and macro-areas (Northern, Central and Southern Italy)]. Results by geographical area were presented in a frame including the indicators of extension and adherence to the national breast cancer screening programs. Mastectomies and quadrantectomies performed in Italy between 2001 and 2008 are reported in Table1 and Table2, respectively. The overall number of mastectomies decreased from 15,754 (year 2001) to 14,197 (year 2008), with an AAPC of −2.1% (−2.3 -1.8). This result is largely driven by the values observed for women in the 45 to 64 and 65 to 74 age subgroups (−3.0%, -3.4 -3.6 and −3.3%, -3.8 -2.8, respectively) and, at a lesser extent, in women aged 75 years and older (−1.2%, -1.7 -0.7). We observed no significant reduction in mastectomies for women aged 25–39 years (+0.3%; -0.8–1.3) and 40-44 years (+1.5%; 0.5–2.5). Data are reported by age. 1Reported data are absolute numbers unless otherwise specified. 2 AAPC (95%CI): Average Annual Percentage Change and 95% Confidence Interval. 1 Reported data are absolute numbers unless otherwise specified. 2 AAPC: Average Annual Percentage Change and 95% Confidence Interval. Data are reported by age groups. As shown in Table2, there was a +4.7% increase in quadrantectomies (95%CI 4.5-4.9) with the actual numbers rising from 22,140 (year 2001) to 30,800 (year 2008). 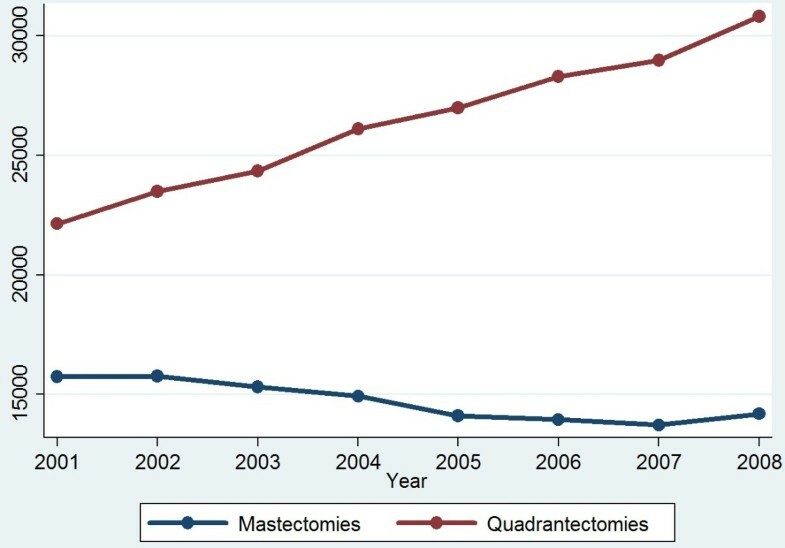 Temporal trends of mastectomies and quadrantectomies between 2001 and 2008 are shown in Figure1. Mastectomies were always performed during ordinary hospitalizations, while quadrantectomies performed in a day hospital regimen progressively increased over the 8-year period (+74.2%), accounting for more than 17.5% of the overall breast surgery procedures in 2008 (data available upon request). Temporal Trends in Mastectomies and Quadrantectomies performed in Italy between 2001 and 2008. Joinpoint analysis for mastectomies and quadrantectomies (absolute numbers) performed in Italy between 2001–8. In Table3, we present data by singular Italian Region and macro-areas (i.e., Northern, Central and Southern Italy). Remarkable decreases in the number of mastectomies performed in Italy between 2001 and 2008 were observed in Northern and Central Italy (−2.7%, -3.0 -2.4 and −2.9%, -3.4 -2.4, respectively) but not in Southern Italy (0.3%, -0.3–0.8), where statistically significant reductions were reported for Campania, Calabria and Sicily only. Data are reported by region and macro-area (Northern, Central, and Southern Italy). Quadrantectomies significantly increased across all the Regions but Valle D’Aosta and Abruzzo. When macro-areas were considered, the most remarkable increase was reported for Southern Regions (+ 3.3%, 3.0–3.5;+ 3.9%, 3.5–4.3 and + 7.2%, 6.8–7.7 for Northern, Central and Southern regions, respectively). In Table4, we report mastectomies and quadrantectomies performed on repeated admissions in the same year between 2001 and 2008. Overall, a total number of 46,610 repeated breast surgeries was performed in Italy between 2001 and 2008. Our data showed a significant increase in any of the subcategories considered but the first one (i.e., subcategory including women who underwent repeated breast surgery once within the same year). Data is presented by categories defined upon the number of repeat major breast surgeries within a year. 2AAPC: Average Annual Percentage Change (with 95% Confidence Interval, CI). In the present study, data from the NHDRs proved a valuable tool in the ascertainment of the real figures of incident breast cancer cases. Indeed, the current indications for quadrantectomies or mastectomies in operable breast cancer, along with the use of well defined codes assigned to breast surgeries at the time of patient discharge, render breast cancer particularly prone to traceability through NHDRs. Based on our results, mastectomies decreased in all the age groups but two (i.e., women aged 25–39 and 40–44 years). Conversely, quadrantectomies showed a significant increase across all the age groups. There was a significant decrease in the number of mastectomies in Northern and Central Italy but not in Southern Italy, where the inter-regional differences were remarkable. Quadrantectomies significantly increased across all the different Regions (but Valle D’Aosta and Abruzzo) and macro areas considered. This study has several strengths. Data were made available by the Italian Ministry of Health. Given that the hospital discharge records provide the basis for hospital care reimbursement within a diagnosis-related groups (DRGs) system, these data are subject to a systematic quality assessment performed at a Regional and central level. Dedicated programs and multidisciplinary workgroups are in place at the Department of Quality Assessment, Management of Medical Care and Ethics of the Italian Ministry of Health to enhance data accuracy and completeness. Constant efforts have led to substantial improvements in data quality. Demographic data accuracy was high. However, inter-regional differences in the completeness of reporting exist and must be taken into account when considering these data. We specifically focused on breast cancer patients having undergone mastectomy or quadrantectomy, whose basic requirement is a histologically-confirmed diagnosis of primary breast cancer. At the same time, we excluded women having undergone excision biopsies and tumorectomies. This approach significantly minimized the inclusion of false positive cases. Repeated admissions were identified and discounted over the entire 8-year period. This increases our confidence in the ability of the NHDRs to differentiate patients with incident breast cancer cases, included in the present study, from patients with prevalent cancers. Data on repeat admissions were approached in a separate set of analyses (Table4). Future work will be oriented towards the identification of factors associated with surgery-related hospital readmissions in breast cancer patients, with a specific focus on tumor size and histology, lymph node involvement, type of surgical treatment and patient demographics. In our analysis, we included data on in situ breast carcinoma. The latter accounted for a small average number of major breast surgeries performed on a yearly basis [i.e., 234 mastectomies (range: 227–301), and 1004 quadrantectomies (range: 725–1300) per year]. In situ breast cancer holds the potentials for malignant transformation. The systematic collection, analysis and reporting of data on carcinoma in situ might help identify risk factors and clarify underlying mechanisms of malignant transformation, thus contributing to breast cancer control research and more targeted treatments[17, 18]. Our study has also some limitations. Based on pre-defined selection criteria, our study population includes women eligible for quadrantectomies or mastectomies. The latter category encompasses patients diagnosed with early and locally advanced breast cancer, while generally excluding patients with metastatic breast cancer (MBC) at the time of diagnosis. On this basis, our analysis is expected to underestimate the actual number of breast cancer incident cancer cases. Currently, the percentage of breast cancer patients who are metastatic at diagnosis approximates 6%, with a 5-year survival rate of 21%. We analyzed data related to the time frame spanning from 2001 to 2008. Variations in admitting practices and treatment protocols for the disease of interest might have occurred over time and by area. In few cases, this could have caused discrepancies between the hospital discharges and the actual occurrence of the disease considered[20, 21]. Notwithstanding the exclusion of incident cases of metastatic breast cancer (by inclusion criteria), the rates obtained from the analysis of the hospital discharge records were higher than those reported by the Italian Ministry of Health in 2006. According to the CRs 2006 report, the number of estimated breast cancer cases for the year 2006 was 37,542. In the same year, we observed 42,258 cases (i.e., +11%). Several factors might contribute to such a discrepancy. First, in our study the linking process allowed the discharge of repeat hospital admission between 2001 and 2008, but discharge data related to patients who had been admitted for breast cancer in years prior to 2001 might still be present. Indeed, 10–15 percent of patients undergoing breast conservative therapy for operable breast cancer (i.e., breast-conserving surgery and postoperative breast irradiation) will develop a loco-regional recurrence within 10 years. This risk is slightly higher than that of a loco-regional recurrence following mastectomy (5 to 10 percent)[23, 24]. However, these rates include both metastases occurring in the ipsilateral preserved breast (i.e., local recurrence) and regional lymph nodes, (i.e., regional recurrence), with only the first representing a potential target for breast surgery. Second, our analysis included data on carcinoma in situ of the breast, which are not routinely collected and analyzed by CRs. Third, the official estimates were based on the use of the Mortality and Incidence Analysis Model method (MIAMOD), a back-calculation approach which obtains cancer-specific morbidity measures by using official mortality data and model-based relative survival from local cancer registry data. As such, the MIAMOD method reflects the limitations stemming from the incomplete coverage and disproportion among macro-areas which characterize the Italian network of CRs. On this basis, underreporting of cases and, consequently, underestimation of the cancer burden cannot be excluded when using the MIAMOD approach. Significant increases in quadrantectomies were reported in women aged 25 to 39 and 40 to 44 years. Women in these age groups are still formally uncovered by the breast cancer screening programs activated by the Italian Ministry of Health, despite they represent 13.6% of women undergoing total major breast procedures. In general, our figures showed inverse trends for mastectomies and quadrantectomies performed in Italy between 2001 and 2008. The increase observed for quadrantectomies and the decrease concerning mastectomies might be interpreted in light of the progressive expansion of the screening programs, and the better adherence to updated treatment protocols. Indeed, mammographic screen-detected cancers show more favorable prognostic features at diagnosis and need less extensive treatment compared to symptomatic cancers. The heterogeneous distribution of such interventions (i.e., screening programs), particularly in Southern Italy, might account for the differences in trends across macro areas and singular regions. Several studies have investigated the use of hospital discharge records to enhance cancer surveillance. In 1996, Huff and co-authors estimated disease occurrence rates from hospital discharge data for breast, cervical and lung cancer at a state- and county level for the state of Maine, US. Consistently with our results, rates from hospital discharge data were higher than rates from cancer registry data. It is noteworthy that the breast cancer rates from NHDRs and Cancer Registry data were the ones with the higher correlation among those considered (correlation coefficients were 0.87, 0.79 and 0.55 for breast, lung and cervical cancer, respectively). We have previously proposed the use of the NHDRs to evaluate the breast cancer burden in Italy. Results across our two studies are fairly consistent. However, results from our previous study were limited by the inclusion of repeat hospital admissions. Moreover, a different and more restricted time window was considered (i.e., 2000–2005). Ferretti et al. used an algorithm based on Regional hospital discharge records to estimate breast cancer incidence in three Italian regions covered by the Italian net of CRs (e.g., Emilia Romagna, Toscana and Veneto). Incidence rates of the two methods showed no statistical differences. However, the authors ascribed the agreement between hospital discharge records and CRs incidence rates to a cross effect of both sensitivity and specificity limitations of the discharge records algorithm. A National system of population-based CRs is essential to monitor cancer patterns and trends at a National and local level and to orient health monitoring and resource allocation decisions. However, the exclusive use of CRs may pose limits to the estimate of cancer burden, mainly due to incomplete and heterogeneous coverage. We suggest the use of the NHDRs to supplement the net of CRs. The latter source (NHDRs) may be a valuable and relatively efficient tool for enhancing cancer surveillance. This work was supported by the Human Health Foundation, Spoleto (PG), Italy (http://www.hhfonlus.org), the Sbarro Health Research Organization, Philadelphia, PA (http://www.shro.org), the DoD, Army Research and Development, and the DoH Commonwealth of Pennsylvania. Authors are also grateful to the Euro Mediterranean Scientific Institute (ISBEM, Brindisi), for data management and analysis. PP, study conception and design, data acquisition, manuscript drafting. MB, manuscript drafting, methodological advise. MC, critical revision for important intellectual contents. MDM, critical revisions for important intellectual contents. AS, critical revisions for important intellectual contents. MD, critical revisions for important intellectual contents. AF, critical revisions for important intellectual contents. AL, critical revisions for important intellectual contents. FP, critical revisions for important intellectual contents. PM, critical revisions for important intellectual contents. GC, critical revisions for important intellectual contents; AA, critical revisions for important intellectual contents. CN, critical revisions for important intellectual contents. AD, critical revisions for important intellectual contents. GDT, data analysis, results’ interpretation. MLB, critical revisions for important intellectual contents. AM, critical revisions for important intellectual contents. IRM, data acquisition, methodological advise. AG, study conception and design, methodological advice. All authors read and approved the final manuscript.